Join us for an afternoon immersion into the beauty, health, importance, and delicious nature of seaweed. 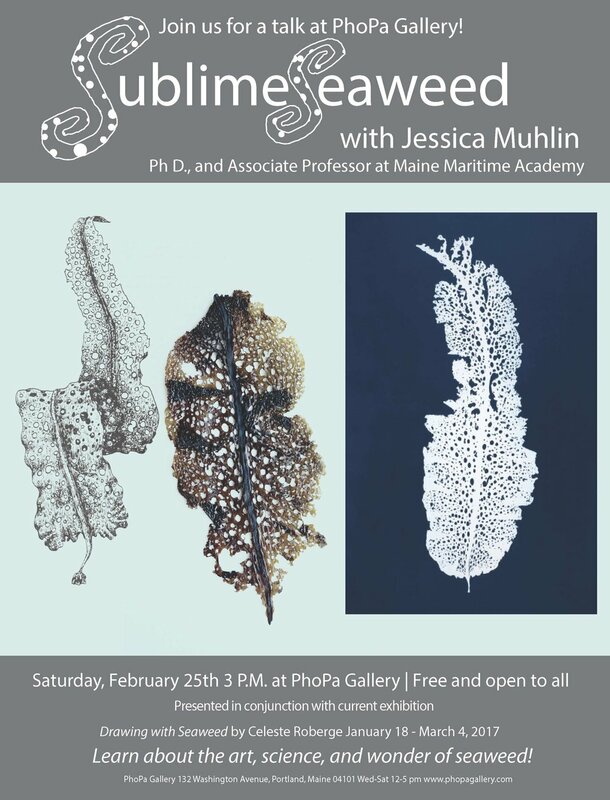 This informal scientific presentation is intended to enhance Celeste Roberge's "Drawing with Seaweed" exhibition, currently on view. Jessica will introduce the audience to the algae, specifically Maine's marine macroalgae. The natural history as well as the uses of algae, both historically and currently, will be explored. All ages are encouraged to attend. This event is free and open to the public. Jessica (Jessie) Muhlin grew up in the suburbs of New York City and became intrigued with marine algae at the age of 14, when she participated in an Acadia Institute of Oceanography’s summer program. She graduated with a B.A. in Biology from Boston University, where she was a student in the BU Marine Program. She had the privilege of spending her junior year of college at the Marine Biological Laboratory in Woods Hole, MA and the BU Tropical Ecology Program in Ecuador, South America. All the while, Jessie maintained an interest in phycology (the study of algae). Upon graduating BU, Jessie attended the University of Maine, Orono, and pursued a Ph.D. in the laboratory of Dr. Susan Brawley. Jessie’s dissertation focused on the reproductive ecology and population genetics of a dominant marine macrophyte, Fucus vesiculosus. Jessie was a National Science Foundation GK-12 Teaching fellow for two years of her graduate studies, creating and teaching science curricula for grades 3-12 in Bucksport, Orono, Old Town, Bradley, Milford, and Bristol, ME schools. Jessie has developed a deep commitment to public outreach and routinely participates in outreach programs through the National Park Service, Maine Sea Grant, the Northeast Algal Society, and the Phycological Society of America. After completing her degree at UMaine, Jessie found her ideal position at Maine Maritime Academy, teaching in the Corning School of Ocean Studies. You can often find her feeding her students an assortment of edible sea vegetables and encouraging everyone to understand and appreciate the algae.